It’s no surprise that Charlotte is becoming a hub for millennials. Our city has one of the nation’s biggest start-up communities, fastest-growing craft brewery scenes, and we’re situated perfectly between the mountains and the ocean, and right next to the biggest man-made lake in our state. 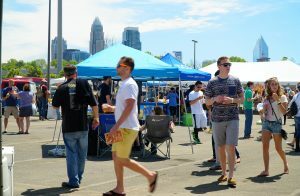 The neighborhood ranking website Niche.com just released their 2017 list of the best cities for millennials, ranking the Queen City among the best places to move for 25-34 year-olds. The list puts a heavy emphasis on how many bars, coffee shops and restaurants are accessible to a city’s residents, as well as education, cost of living, diversity (ethnic, generational and economic) and employment. They used public data from the U.S. Census and Bureau of Labor Statistics, as well as overall city ratings submitted by Niche.com users. Full methodology details are available here. Charlotte came in at #18, beating out New Orleans (#19), Salt Lake City (#20), and Houston (#21). The top 3 spots this year went to New York (#1), Austin (#2), and Washington, DC (#3). The site also ranked Charlotte’s Third Ward neighborhood as the best area for millennials within the Queen City. Do you agree with the ranking?